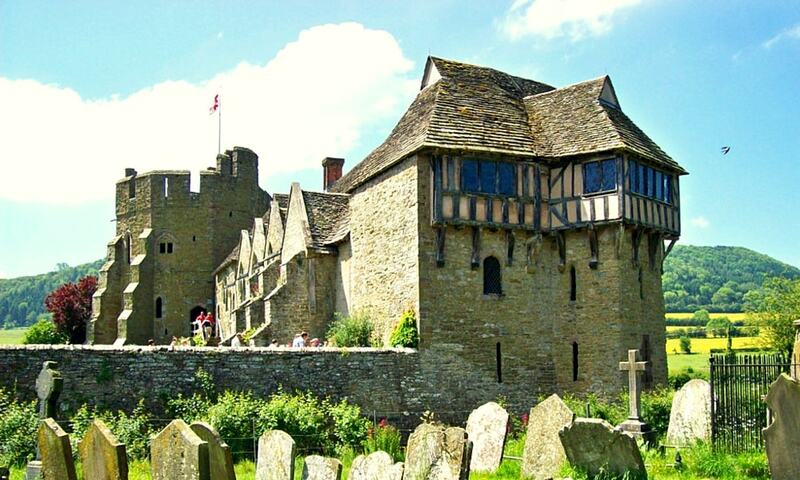 One of the finest and best-preserved fortified medieval manor houses in England, Stokesay Castle was constructed at the end of the 13th century by Laurence of Ludlow, who at the time was one of the richest men in England. The castle comprises a walled, moated enclosure, with an entrance way through a 17th-century timber and plaster gatehouse. Inside, the courtyard faces a stone hall and solar block, protected by two stone towers. The hall features a 13th-century wooden-beamed ceiling, and 17th-century carved figures ornament the gatehouse and the solar. The castle was never intended to be a serious military fortification, but its style was intended to echo the much larger castles being built by Edward I in North Wales.